Thank you for all your kind comments on my last post, the colours of the blankets are indeed working wonders for my mood, they cannot make my worries disappear but they can certainly tint them a little brighter. I bought this Liberty print on Ebay some time ago and as usual I spent too long paralysed by indecision as to what to make from it. Eventually I decided to play it safe and went another Yard Sale Wrap Skirt, from Weekend Sewing: More Than 40 Projects and Ideas for Inspired Stitching . I made this last year and thoroughly enjoyed the whole twirliness of it. Thankfully this time around I knew about all about the errata before I began. 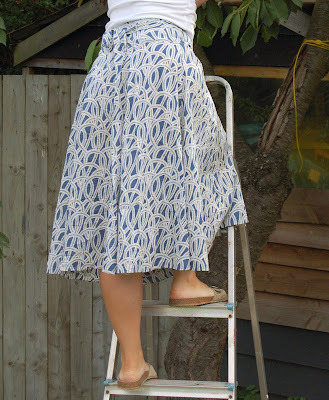 The lady in the book wears her skirt whilst looking rather fetching up a ladder in the orchard. I thought I would re-create that image for you. This is me just casually picking fruit in my new skirt. I always hold my tummy in and stretch that way when cherry picking. It looks beautiful on you. I can't think of a more liberating way to pick fruit. Wonderful! That is a beautiful skirt... and it looks very fetching on you half way up a ladder! Very pretty skirt - well done! But you don't know much about tummies... there's no way THAT flat front could be called a tummy! Beautiful skirt made with beautiful fabric. It just seems to sum up what summer is all about! Holding in WHAT tummy exactly? ;-) Lovely skirt by the way. I have issues fitting skirts but this one looks like it might work for me. 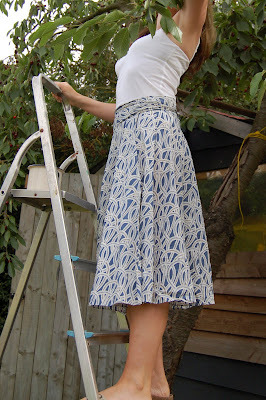 Its a gorgeous skirt, and now all I need to do is buy Weekend Sewing and some Liberty. As if I need encouragement to buy books and fabric. It looks very lovely indeed! Lovely skirt and Lovely YOU! the perfect use for fab fabric. That is wonderful, it looks great on you! I need to try my hand at this skirt. I've seen it in so many wonderful prints that it's about time. Love yours! oh yeah. that is one cute skirt. and your photos make me smile! You are so witty and fun! And your skirt is gorgous!